“Salon style” is a way of displaying art in which works are hung higher and lower than eye level and in large groups rather than in a single row. This trend started in 1737 with the Salon in Paris. Unlike the Salon, however, today’s trend in museums is to exhibit works of art in single rows with plenty of space around each piece. While we always follow this trend in our museum, we brought back salon style for this particular exhibit. This wasn’t entirely an aesthetic choice. We are preparing for a new art storage rack system to be installed, so rather than store these works away from the public during that three-month construction, we decided to mount this exhibition for your enjoyment. In this unprecedented exhibit, over 200 pieces from our collection will be on display created by artists such as Andrew Wyeth, Winslow Homer, Clyde Singer, and more, many of which are considered the masterpieces of our collection. Come see these masterpieces from our vault from November 21, 2018 - February 17, 2019. 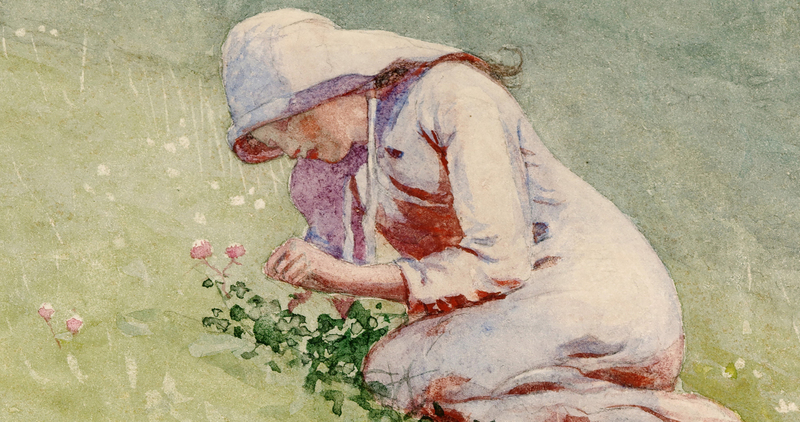 Pictured above: Winslow Homer, "Girl Picking Clover"
Our collection contains over 300 watercolor paintings, one of which is a piece that we recently acquired by famed artist Childe Hassam. See it here.